You might have a 1/1 in your collection, but do you have a 1/1/1/1 ? Yeah, 1/1’s are rare. They are great and what many collectors dream about. I always drool over them for sure. As I am sitting at about 143 of them right now, I have to say that I don’t do a double take nearly as much as I used to when I didn’t have any. Well, friends – here it is. 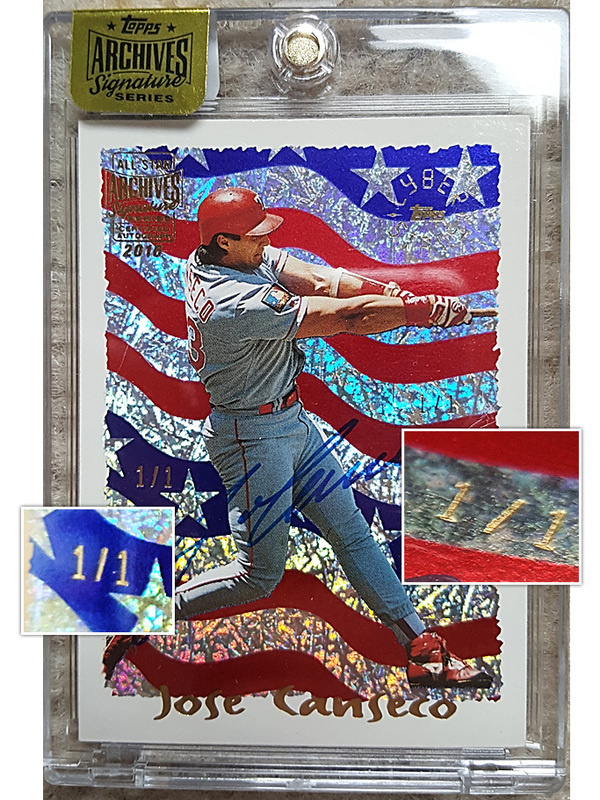 The 1/1/1/1 – also known as the DOUBLE ONE OF ONE! A 1/1 so nice, they stamped it twice! It doesn’t show up in pics too well, and didn’t through text either, so I was wondering if the 1/1 stamp was just imprinted on the right side. NOPE – it too, is gold. You can see it much better in person. I *love* stuff like this that is unusual – it is a HUGE plus that it is a gorgeous signed 1/1…. I mean 1/1/1/1 🙂 I think I’m now at 97 or so unique 2015-2016 Topps Archives Signature Series Canseco cards. 3 more ’til I hit 100! I love this card. In 1995, Topps used a computer program and ‘played’ the remaining games in the 1994 season, and kept stats for all of the players. In the 1995 Topps set, they made a Cyberstats parallel card which featured each players stats including the ones from the computer simulation. In the 1995 complete set, Topps issued a Cyberstats Season in Review insert set, featuring either 6 or 7 cards highlighting big moments in the season, as well as the ALCS, NLCS, and 1994 World Series. The Canseco card Highlights not only the AL Wild card 1-game playoff, but also that Canseco hit his 50th Home Run in the game. Had Topps’s stats held true and the strike had not happened, Canseco would be a member of the 50 HR club, and he would’ve had 482 Home Runs when he stopped playing, and perhaps a team would’ve picked him up and he would’ve got the 18 Home Runs he needed to get in the 500 HR club, and possibly making himself a slam dunk case for the Hall of Fame. All of the what-ifs that happened just because of 1 little card. I would love to get one of those cards signed. Congrats on getting the Canseco! Thanks Jeremy, for writing! You know, I never read the back – sure enough, it talks about him hitting his 50th. I love it! I actually made a card called “What if? 500” where on the back of the card, it talks about how he hit his 500th home run after being picked up by the Dodgers. I had Jose sign and inscribe it HR #500 5/9/03. Nice. Maybe next time you see him you can have him inscribe the Archives card with #50.